222-224 Beacon are located on the north side of Beacon, between Clarendon and Dartmouth, with 218-220 Beacon to the east and 226 Beacon to the west. 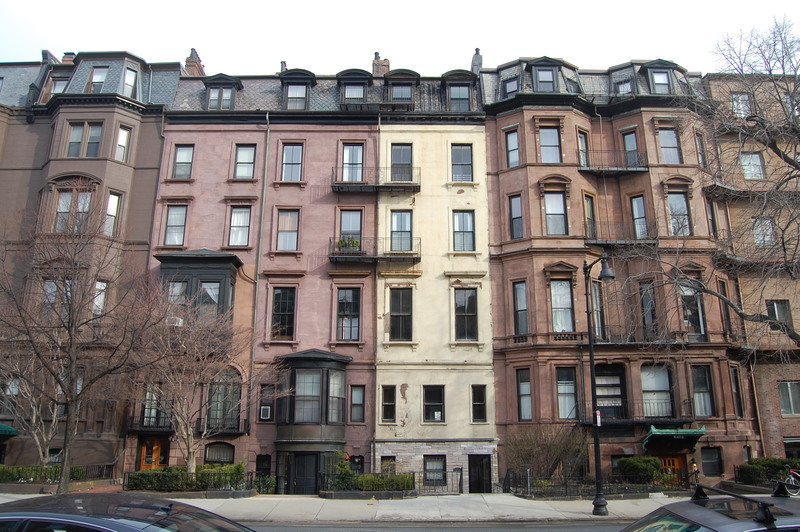 222 Beacon and 224 Beacon were designed and built in 1866 by architect and builder Charles K. Kirby for speculative sale, designed as a symmetrical pair. Charles Kirby purchased the land for the two houses on February 12, 1866, from Robert Charles Winthrop and Horatio Hollis Hunnewell, trustees for George Derby Welles (Robert Winthrop’s stepson and H. Hollis Hunnewell’s nephew). They had purchased the land on October 28, 1862, from the Boston and Roxbury Mill Corporation. Click here for an index to the deeds for 222-224 Beacon. They were owned by the same owner from 1895 and combined into a single property in the early 1920s. On April 28, 1866, 222 Beacon was purchased from Charles Kirby by Alvin Adams, the founder and owner of the Adams Express Company. He and his wife, Anne Rebecca (Bridge) Adams, lived in Watertown. 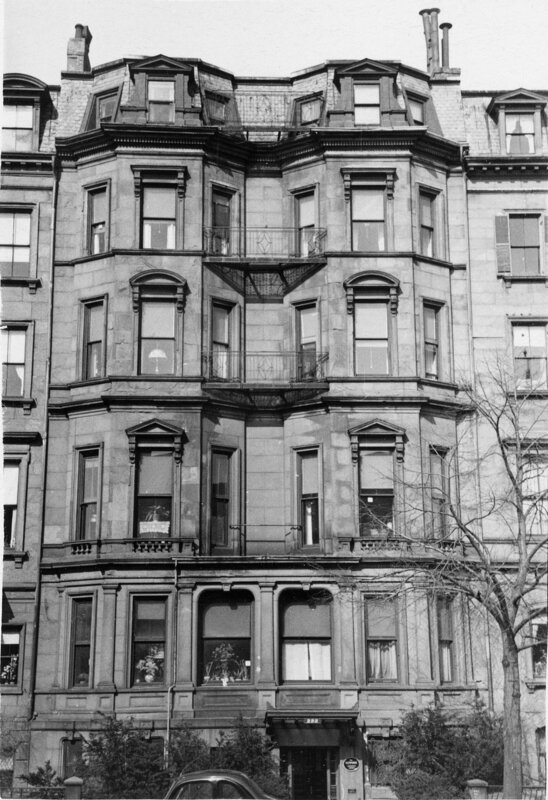 222 Beacon became the Boston home of Alvin and Anne Adams’s son and daughter-in-law, Waldo Adams and Isabella H. (Burnham) Adams. Waldo Adams was the New England manager for his father’s company. His unmarried brother, Edward Livingston Adams, lived with them. He was associated with the Adams Express Company until about 1870, when he became treasurer of the Little Rock and Fort Worth Railroad. Edward Adams married in February of 1870 to Emily Macy. 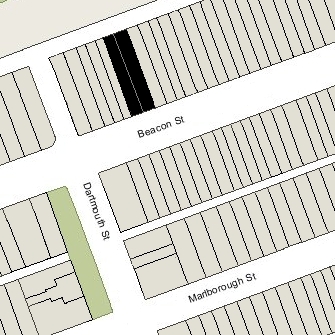 They lived with his brother and sister-in-law at 222 Beacon in 1871, but by 1872 had moved next door to 224 Beacon. Alvin Adams died in September of 1877. 222 Beacon remained the property of his estate. During the next four seasons, Waldo and Isabella Adams lived elsewhere, probably in Watertown with his widowed mother, and leased 222 Beacon to others. During the 1878-1879 winter season, it was the home of Susan Burley (Howes) Cabot, the widow of Salem merchant and banker Joseph Sebastian Cabot. She previously had lived at 45 Mt. Vernon. Later in 1879, she was living at 12 Commonwealth, and by the 1879-1880 season had moved to 34 Beacon. By the 1879-1880 winter season, 222 Beacon was the home of William Arnold Buffum, a noted collector of amber, and his wife, Marian (Simmons) Buffum. They continued to live there in 1881, but moved soon thereafter to 56 Commonwealth. By the 1881-1882 winter season, 222 Beacon was the home of Charles Porter Hemenway and his wife, Ellen Louise (Tileston) Hemenway. They also maintained a home in Swampscott. Charles Hemenway was a shipping merchant in the South American trade in the firm of Hemenway & Browne, established by his brother, Augustus Hemenway. Charles and Ellen Hemenway previously had lived in New York City. They returned to Boston after the death of Augustus Hemenway in 1876 and Charles Hemenway became managing partner of the firm. Augustus Hemenway’s wife, Mary Porter (Tileston) Hemenway, was the sister of Charles Hemenway’s wife, Ellen. 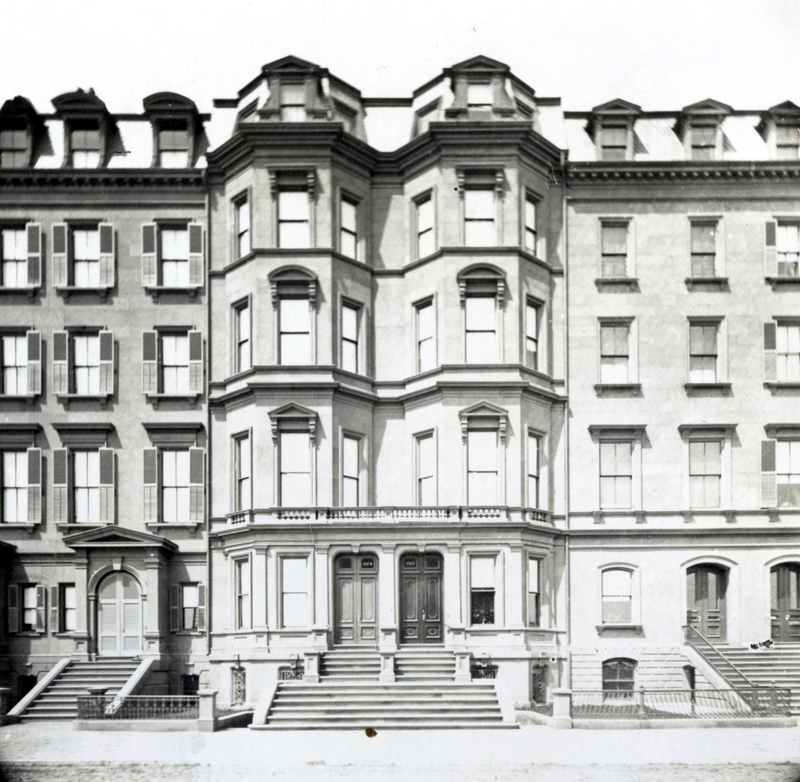 The Hemenways continued to live at 222 Beacon during the 1882-1883 season, but moved soon thereafter to 242 Beacon. Waldo Adams’s mother, Anne Rebecca (Bridge) Adams, died in January of 1882 in Watertown, and by the 1883-1884 winter season, Waldo and Isabella Adams once again were living at 222 Beacon. Waldo Adams died in March of 1892. Isabella Adams continued to live at 222 Beacon during the 1892-1893 season, but moved thereafter. 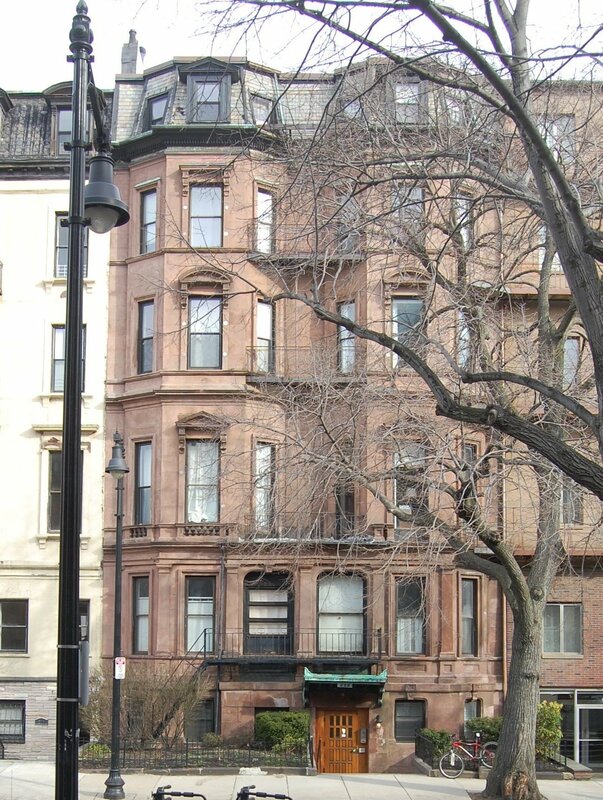 By the 1896-1897 winter season, she was living at The Ludlow (southwest corner of Clarendon and St. James). 222 Beacon was not listed in the 1894 Blue Book. By the 1894-1895 winter season, it was the home of Perkins Bass and his wife, Clara (Foster) Bass. They also maintained a home in Peterborough, New Hampshire. Perkins Bass had been an attorney in Chicago and served as US Attorney for Northern Illinois during the Lincoln Administration. They continued to live at 222 Beacon during the 1895-1896 season, but moved thereafter to 441 Beacon. On November 25, 1895, 222 Beacon was acquired from Alvin Adams’s estate and heirs by Margaret White (Pierson) Richardson, the wife of Dr. Maurice Howe Richardson, a physician and surgeon. The Richardsons lived at 224 Beacon and leased 222 Beacon to others. By the 1896-1897 winter season, 222 Beacon was the home of wool broker John Hurd Hutchins and his wife, Olivia Lee (Endicott) Hutchins. They previously had lived at 315 Marlborough. They continued to live at 222 Beacon in 1900. During the 1900-1901 winter season, the Hutchinses lived elsewhere and 222 Beacon was the home of dry goods merchant Francis Wright Fabyan and his wife, Edith (Westcott) Fabyan. They previously had lived at 217 Beacon in 1900, and had moved to 146 Commonwealth by the next season. The Hutchinses were again at 222 Beacon for the 1901-1902 winter season, but had moved to 262 Beacon by 1903. 222 Beacon was not listed in the 1903-1913 Blue Books. Maurice Richardson died in July of 1912. Margaret Richardson continued to live at 224 Beacon. On October 31, 1913, 222 Beacon was purchased from Margaret Richardson by Edith (Paine) Storer, the wife of real estate developer John Humphreys Storer. They previously had lived at 286 Beacon. They also maintained a home in Waltham. The Storers continued to live at 222 Beacon during the 1919-1920 winter season, but moved thereafter to Cambridge. By the 1920-1921 winter season, 222 Beacon was the home of Roxanna Laura (Videtto) Clarke, the widow of Randolph K. Clarke, who leased the house from the Storers and operated it as a lodging house. She previously had lived at 121 Newbury, where she also had operated a lodging house. On October 3, 1922, Roxanna Clarke purchased 222 Beacon from Edith Storer. In December of 1923, John Storer purchased 224 Beacon. On May 2, 1924, he purchased 222 Beacon back from Roxanna Clarke and combined the two buildings and converted them into a single lodging house. Roxanna Clarke continued to live at 222 Beacon and to operate the lodging house in the combined building. On May 3, 1866, 224 Beacon was purchased from Charles Kirby by Freeman Cobb. He and his wife, Annette (Cobb) Cobb, made it their home. They previously had lived at 228 Beacon. Freeman Cobb is credited as one of the founders of the express/stagecoach business in Australia, where he had gone in the mid-1850s on behalf of the Adams Express Company. He subsequently founded his own stagecoach line in Australia, but soon returned to the United States. After an unsuccessful foray into banking, he re-joined Adams Express as manager of the Boston agency. Waldo Adams and Edward Livingston Adams, sons of Alvin Adams, founder and owner of the Adams Express Company, lived at 222 Beacon. The Cobbs also maintained a home in Brewster (which he had represented in the State Senate in 1864-1865), and by 1869 they had made it their primary residence. By 1869, 224 Beacon was the home of Josiah Caldwell and his wife, Anita (Smith) Caldwell. They lived at 224 Beacon while they were building a new, large house at 299 Berkeley. A former clothing merchant, Josiah Caldwell was an investor and stock promoter of coal mines and railroads. He was a principal promoter of the Little Rock and Fort Smith Railroad in the late 1860s and early 1870s. In about 1870, Edward Livingston Adams became treasurer of the railroad. He and his wife, Emily Macy, lived next door at 222 Beacon with his brother and sister-in-law, Waldo and Isabella (Burnham) Adams. On March 19, 1870, Josiah Caldwell purchased 224 Beacon from Freeman Cobb, and on May 17, 1870, he sold it to Frances Elizabeth (Sistare) Gookin, the wife of Samuel Henry Gookin. He was a dry goods merchant and railroad investor. They lived at 12 Commonwealth. In March of 1871, a railroad strike by unpaid workers caused the Little Rock and Fort Smith Railroad to default on bonds it had sold in 1869. That default, probably coupled with other financial difficulties, prompted the Caldwells to leave Boston before their new home 299 Berkeley was completed. By 1872, they were living on the San Ricardo sugar plantation in Cuba owned by Anita Caldwell’s father, Richard Dimock Smith, and it does not appear that they resumed residence in Boston. The bond default also indirectly led to US Representative James G. Blaine losing the 1876 Republican presidential nomination. It was alleged that Josiah Caldwell had provided bonds in the railroad to Blaine, who was Speaker of the House, in exchange for his support of granting rights of way to the new railroad, and that the Speaker subsequently prevailed on several other railroads to buy the bonds from him at an inflated price before the default. In about 1872, Edward and Emily Adams moved from 222 Beacon to 224 Beacon. By 1873, they had moved to 116 Marlborough. By 1874, Samuel and Frances Gookin had moved from 12 Commonwealth to 224 Beacon. They continued to live there in late 1875 but moved thereafter to Salem. By 1875, 224 Beacon also was the home of John Wooldredge and his wife, Emily (Dunbar) Wooldredge. John Wooldredge was a shoe manufacturer in Lynn, where they also maintained a home. He also was President of the Eastern Railroad and the First National Bank of Lynn. They continued to live at 224 Beacon in 1877. By 1878, they probably had made Lynn their primary residence, but Emily Wooldredge also was listed in the Blue Book at 159 Beacon for the 1877-1878 winter season. On May 15, 1877, 224 Beacon was acquired from Samuel Gookin by William Brown Dinsmore. He and his wife, Augusta Manners (Snow) Dinsmore, lived in New York City. He was a partner of Alvin Adams in the Adams Express Company and his son, William, Jr., was married to Alvin Adams’s daughter, Helen Frances Adams. 224 Beacon was listed as vacant in the 1878 Blue Book, and was not listed in the 1879-1884 Blue Books. On March 28, 1884, 224 Beacon was purchased from William Dinsmore by Caroline Bartlett (Tirrell) Eastham, the wife of brush manufacturer and dealer William W. Eastham. They previously had lived at 12 Beacon. Their daughter, Annie Estella Eastham, lived with them. Annie Eastham married in October of 1884 to Chester Guild, Jr., a wholesale dry goods merchant. After their marriage, they lived at 224 Beacon. Caroline Eastham died in April of 1887 and William Eastham and the Guilds moved soon thereafter to Newton. 224 Beacon was not listed in the 1888 Blue Book. On March 14, 1888, 224 Beacon was acquired from William Eastham and Annie (Eastham) Guild by oil dealer John Hatch Haines. He and his wife, Jane (McCleary) Haines, made it their home during the 1888-1889 winter season, but moved thereafter, probably to Providence, where he died in September of 1889. On February 2, 1889, 224 Beacon was purchased from John Haines by Margaret White (Pierson) Richardson, the wife of Dr. Maurice Howe Richardson. They previously had lived at 66 Beacon. Dr. Richardson was a physician and surgeon, and was Moseley Professor of Surgery at Harvard Medical School. He maintained his medical office at 224 Beacon. In 1911, he was named surgeon-in-chief at Massachusetts General Hospital. The Richardsons’ six children lived with them: Edward Pierson Richardson, Mary Tuckerman Richardson, Maurice Howe Richardson, Jr., Henry Barber Richardson, Margaret Richardson, and Wyman Richardson. In November of 1895, Margaret Richardson acquired 222 Beacon, next door, which she leased to others. Mary Tuckerman Richardson married in October of 1907 to Robert Richards Walcott, a lawyer, and moved to Cambridge; Margaret Richardson married in June of 1912 to Gracie Hall Roosevelt, the nephew of President Theodore Roosevelt and brother of Eleanor Roosevelt. They moved to New York and divorced in 1925. Maurice Richardson died in July of 1912. Margaret Richardson continued to live at 224 Beacon with their four unmarried sons. In October of 1913, she sold 222 Beacon to Edith (Paine) Storer, the wife of real estate developer John Humphreys Storer. The Storers made it their home. Henry Barber Richardson, a physician (and winner of two Olympic bronze medals for archery), married in May of 1916 to Margaret Seymour Carpenter and moved soon thereafter to Baltimore. Edward Pierson Richards, a physician, married in May of 1917 to Clara Lee Shattuck and moved to 319 Dartmouth. Maurice Howe Richardson, Jr., an insurance broker, married in June of 1922 to Julia Dorothea Reilly and moved to Brighton. Wyman Richardson, a physician, married in August of 1922 to Charlotte Blake Richardson and they moved to 60 West Cedar. Margaret Richardson continued to live at 224 Beacon. Her son, Edward, also continued to maintain his medical office there, and in about 1922 she was joined by her daughter, Margaret Roosevelt, who had recently separated from her husband. Margaret Richardson moved to Brookline in about 1923. On October 31, 1923, 224 Beacon was acquired from Margaret Richardson by real estate dealer William J. Stober, and on December 11, 1923, he transferred it to John H, Storer. The Storers had moved from 222 Beacon and had sold it to Roxanna Clarke, who operated it as a lodging house. In May of 1924, John Storer purchased 222 Beacon back from Mrs. Clarke. In April of 1924 (after acquiring 224 Beacon but before taking title to 222 Beacon), John Storer filed for (and subsequently received) permission to combine 222 Beacon and 224 Beacon and convert them into lodging houses. As part of the remodeling, doors were cut through the party wall connecting the two the buildings, the front entrances were lowered to street level, and the interior was remodeled. The remodeling was designed by architects Haven and Hoyt. The combined lodging house was operated by Roxanna Clarke, who had operated the lodging house at 222 Beacon since about 1921. In September of 1924, John Storer entered into an agreement with the Salmagundi Club to operate a public restaurant in the basement of the building. In June of 1926, Roxanna Clarke filed for (and subsequently received) permission to convert an existing storage building at the rear of the property into a two car garage. In March of 1929, a complaint was filed with the Building Department, noting that the building was not zoned for a restaurant. In May of 1929, John Storer filed for permission to change the occupancy of 222-224 Beacon from a lodging house to a lodging house, community dining room, and kitchen. The permit was denied by the Building Department but the denial was reversed by the Board of Appeal in June of 1929 (largely on the grounds that the restaurant had been there prior to the effective date of the 1924 Zoning law), with provisos that the permission was granted only for the current operator (the Salamagundi Tea Room) and there could be no exterior changes. Edith Storer died in May of 1924 and John Storer died in December of 1935. 222-224 Beacon remained the property of his estate. Roxanna Clarke continued to operate the lodging house at 222-224 Beacon until her death in 1938. On February 15, 1943, 222-224 Beacon was acquired from John Storer’s estate by Philip Kahn. The property subsequently changed hands and was acquired on April 26, 1946, by Francis J. Malinowski and his wife, Mary V. Malinowski. The Malinowskis continued to operate the building as a lodging house and restaurant, expanding the operation to include a gift shop. In June of 1947, they were ordered to remove the gift shop, inasmuch as it was not permitted under the 1929 Board of Appeal decision allowing the restaurant use. On August 8, 1947, 222-224 Beacon was acquired from the Malinowskis by Amos A. Peterson, trustee of the Salmagundi Building Trust. It continued to operate it as a lodging house and restaurant. On February 1, 1957, 222-224 Beacon was acquired from the Salmagundi Building Trust by David Adams, trustee of the Fordham Realty Trust. He continued to operate the buildings as a lodging house and restaurant. In April and again in September, there were small fires which damaged portions of the upper floors. On October 22, 1958, 222-224 Beacon was acquired from David Adams by architect Saul E. Moffie. On October 6, 1959, he transferred the property to himself and his wife, Rose (Christie) Moffie, as trustees of the Edy Realty Trust. In May of 1961, Saul Moffie filed for (and subsequently received) confirmation that the legal occupancy of the property as 17 apartments and a restaurant, noting that this was an existing condition. The Salmagundi Restaurant continued to operate in the basement in 1962, but by 1963 had been renamed Le Montparnasse Restaurant. In May of 1967, Saul Moffie filed for (and subsequently received) permission to eliminate the restaurant use and convert the property into 23 apartments. He also requested (and received) permission to tear down the garages and accessory buildings at the rear of the property. In November of 1969, Snelling Robinson Brainard and David V. Harkins, trustees of the Beacon Street Improvement Trust, filed for permission to tear down 222-224-226-228-230-232-234 Beacon and replace them with a 32-story, steel framed and brick clad tower at the northeast corner of Beacon and Dartmouth. The building would have had 96 units and a 100 car garage. A companion, 36-story building was proposed at the same time on the northwest corner of Beacon and Dartmouth, replacing 236-238-240-242-244-246 Beacon. The proposed twin-tower project met with strong opposition from residents and was abandoned after the City established height limits on all buildings in the residential portion of the Back Bay. On May 31, 1972, 222-224 Beacon was acquired from Saul and Rose Moffie by Bette J. Arnold, and on the same day she transferred the property to herself and Judith A. Cowin as trustees of the Rolls Royce Realty Trust. On September 1, 1978, 222-224 Beacon was acquired from Bette Arnold by real estate broker and investor Patrick J. Glynn. On January 22, 1991, he transferred the property to himself and his wife, Anne T. Glynn, as trustees of the 222-224 Beacon Street Trust, and on May 15, 1997, they transferred the property to the 222-224 Beacon Street Limited Partnership. The property remained apartments in 2015.